Click on any photograph to view a larger image. In the Good Old Summertime. With the long dreary winter finally behind us, everyone is looking forward to the summer with its sunshine and even its hot humid days. 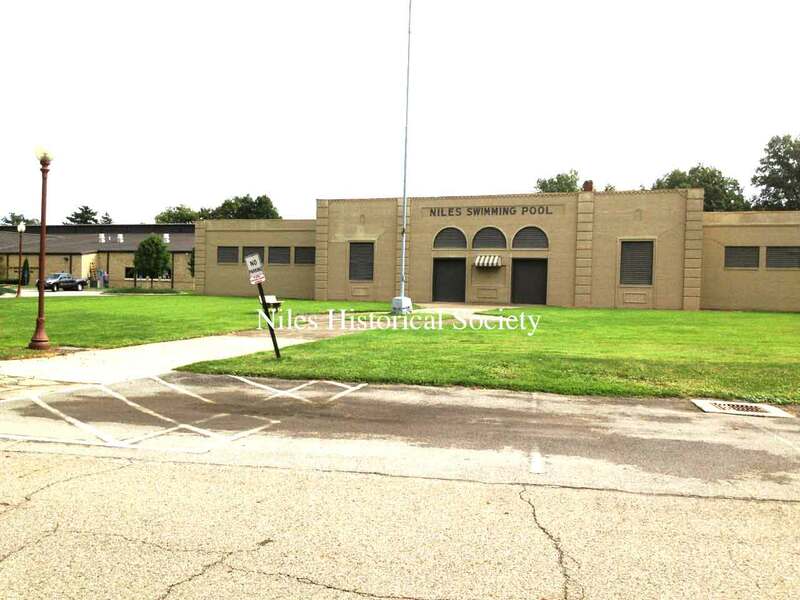 For many years in Niles that would mean spending hours swimming, sunbathing, and having fun with family and friends at Waddell Pool(a.k.a. 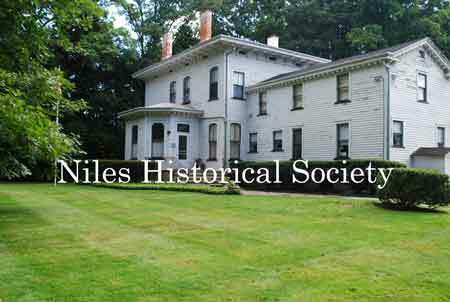 Niles Swimming Pool). 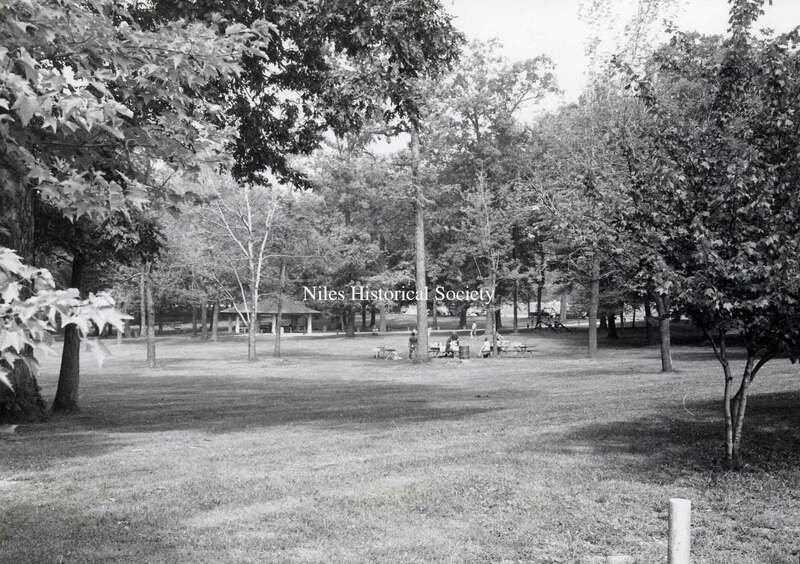 In July 1929 Jacob D. Waddell, vice president of Empire Steel Corporation, presented the city with 52 acres of land to be used as a municipal park. 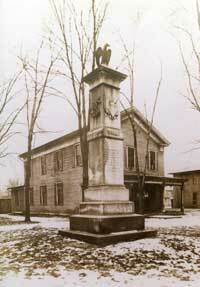 It was located just outside the city limits between Park and Warren Ave. and on both sides of Lovers Lane. Mr. Waddell was hailed as “Niles’ Greatest Benefactor” for his generous gift. Plans to improve the land with electricity and sewage began immediately. 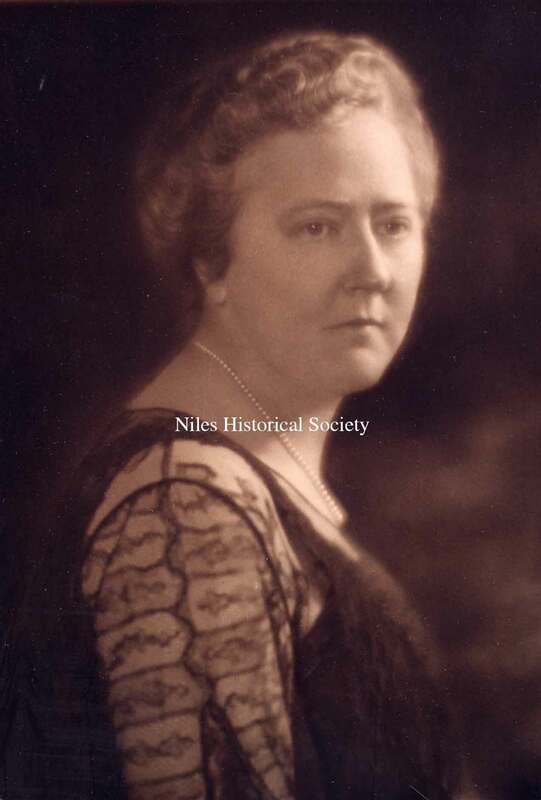 By June 1930 a new baseball field was dedicated with Mrs. Waddell throwing out the first pitch. It was hoped that a swimming pool might someday be added to the park. 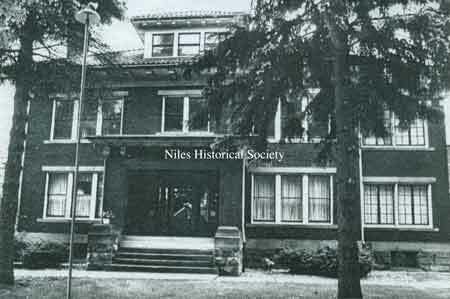 The Waddells were the last residents of the Ward-Thomas House, now the museum of the Niles Historical Society. Their portraits are displayed there. With the Great Depression of the 1930’s in full effect, the federal government announced a public works program offering to pay 30% of the cost of projects that would give work to the needy. 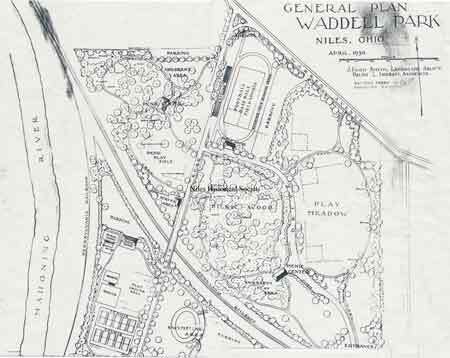 The idea of a swimming pool and bath house in Waddell Park began to take shape. City council applied for $40,000 under the National Recovery Act. The architects were Ackley, Bradey, and Nelis from East Liverpool. 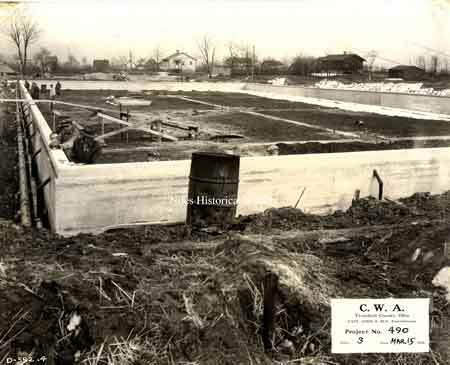 The first concrete was poured in February 1934 and work began as soon as construction material arrived. Warren at the time was also building their slightly smaller swimming pool in Packard Park under the same program. The pool was dedicated Wednesday July 25,1934. The newspaper stated,” to several thousand swimming enthusiasts of the city, today marks a noted change from an unsanitary dirtied water creek swimming hole to the most modern and up-to-date pool.” S.J. Bonham, superintendent of Niles schools, delivered the address. The pool staff were introduced including pool manager, cashiers, checkroom attendants, and lifeguards. The night included a water pageant, diving exhibition, and music by the high school band. A flag donated by Mrs. Waddell was raised. The ceremony was attended by 5,000 people after which 750 made use of the new pool. 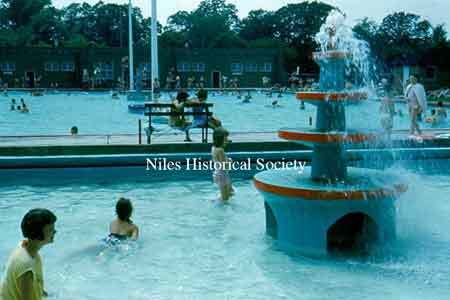 Niles had one of the most outstanding, modern, and largest civic pools in the state. Pool hours were from 9:30-9:00. In the morning various groups could swim for free. Monday morning was the only time “colored people” could use the pool. Lou Tabor in his memoirs tells of convincing city administrators to let black citizens use the pool equally since they were taxpayers as well. Tuesday mornings was for children from playgrounds east of Mosquito Creek and Wednesday was for those from the west side. All other times admission was $.20 for adults and $.10 for children. Rules included compulsory showers and the exclusion of those with communicable diseases and open sores. Of course no boisterous play or smoking was allowed. Bathing suits had to be clean, modest, and meet the approval of management. The wearing of swim trunks without shirts was not permitted. 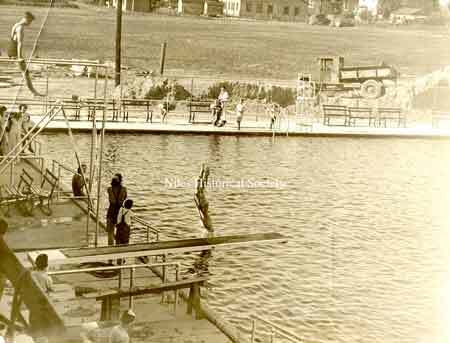 That short first pool season ended on September 16,1934. Entrance fees collected totaled $1,574.70 from 8,325 children and 3,711 adults. Free swimming was provided for 3,816. 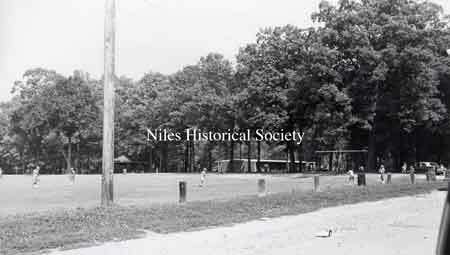 View of Niles City Pool in Waddell Park. 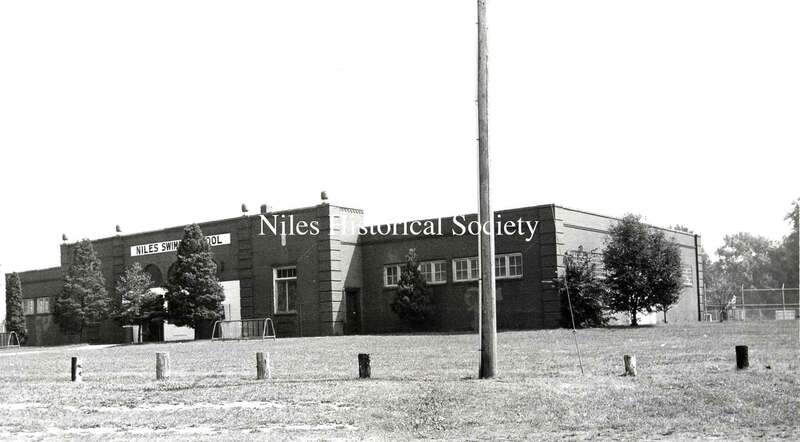 The main entrance to the Niles Swimming Pool as it appeared in 1934. The left side had the changing rooms for women and girls while the right side was for men and boys. 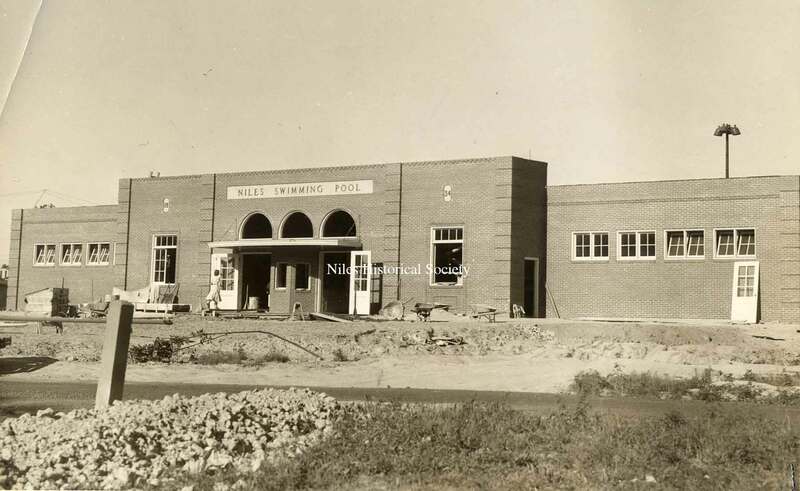 The front center was the ticket booth and a storage center in the back for depositing your street clothes in a wire basket. A small brass tag with your basket number was exchanged for your basket of clothes. 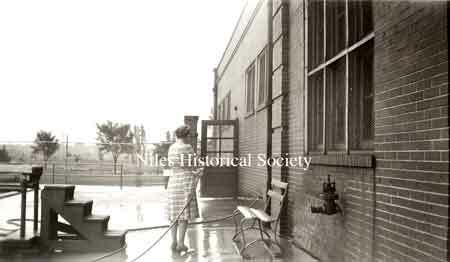 Each dressing room side had a chlorinated water bath that you walked through before entering the pool area. 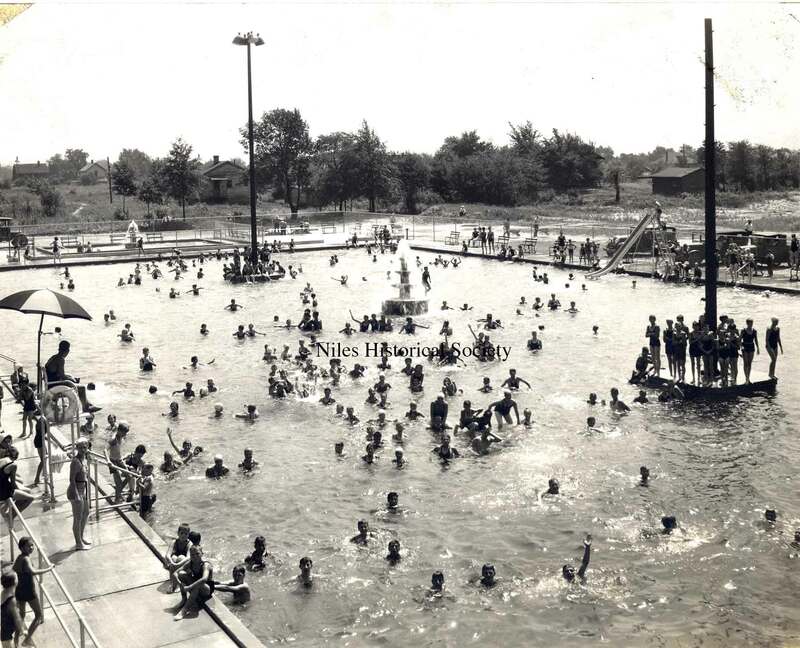 Through the decades countless children and adults have vivid recollections of swim lessons, birthday parties or picnics, and days of swimming in the pool. 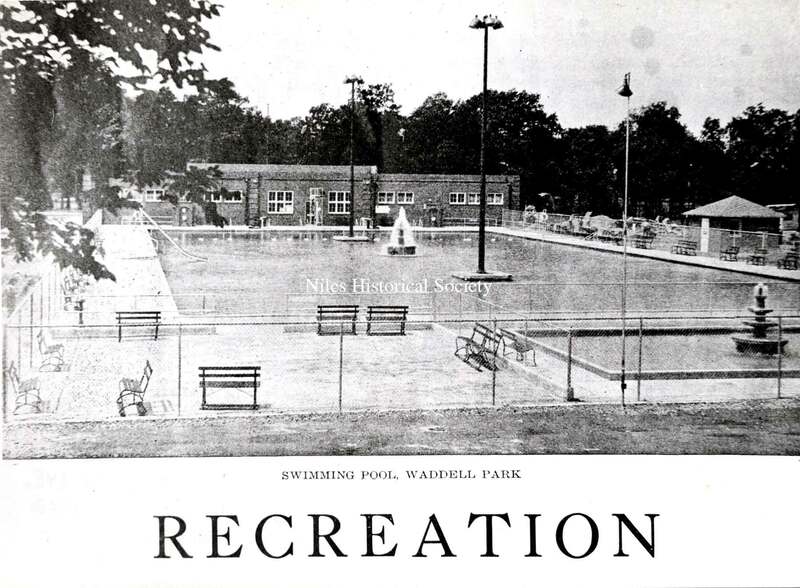 Waddell Pool opened in 1934 and closed in 2014. Although its future is uncertain today, many fondly remember its past. 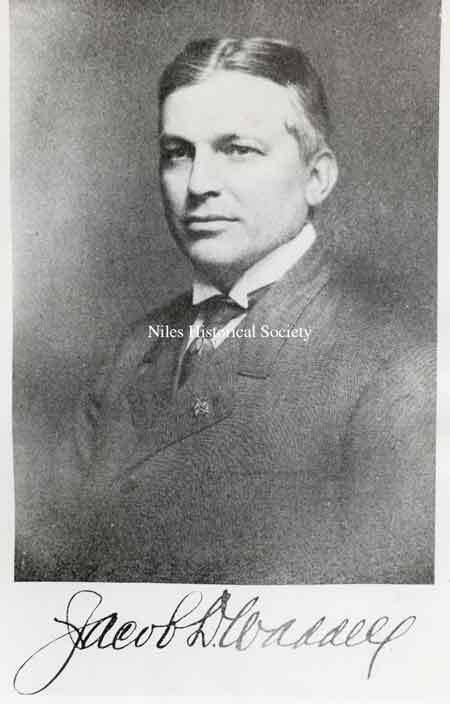 Jacob D. Waddell (1870-1939) was born in Trumbull County and learned the iron and steel business at Youngstown Sheet & Tube and The Briar Hill Steel Company. He married Mary A. Thomas in 1918, organized and headed Mahoning Valley Steel Company with W. Aubrey Thomas and Thomas E. Thomas. 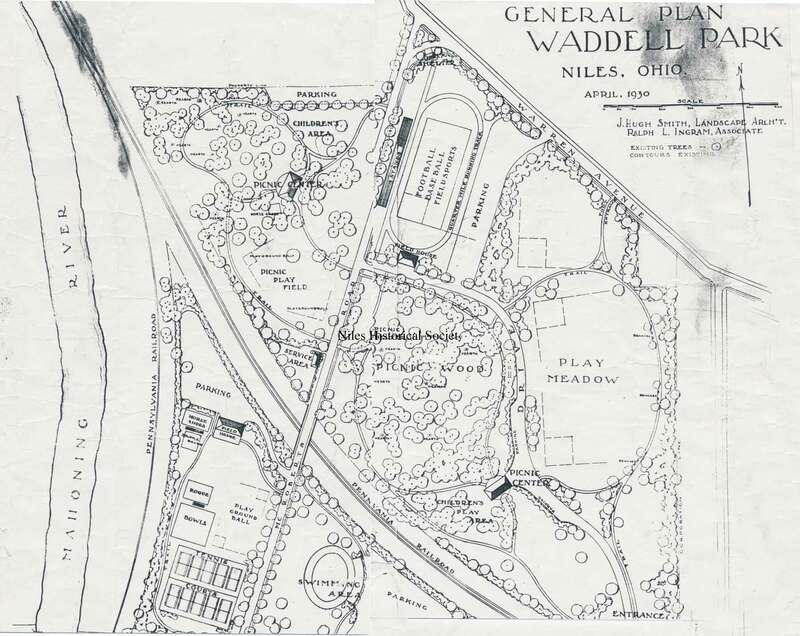 In 1924 Jacob D. Waddell took over the Empire Steel Company which was located on the south side of the Mahoning River and east of the Erie Railroad. It became Waddell Steel until the Great Depression when it was shut down. 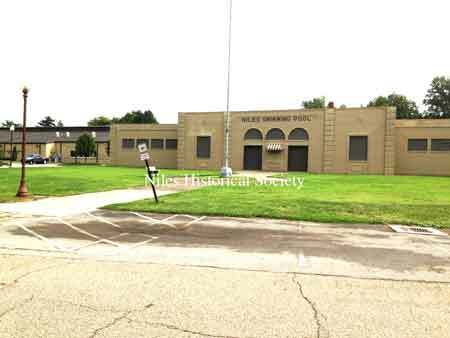 Mr. Waddell continued his leadership in Niles by serving as President of the Niles Bank Company and First Director of the Mahoning Valley Sanitary District. In 1931, Jacob and Mary Waddell completed their magnificent gift to the City of Niles-Waddell Park. 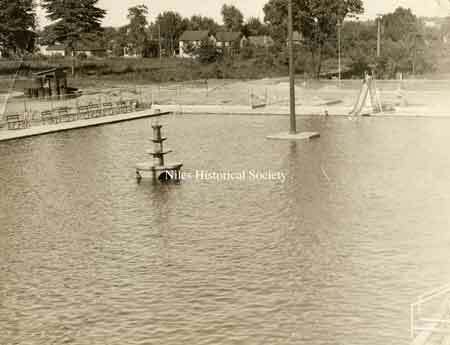 Two slightly different views of Waddell Park before the pool was built. 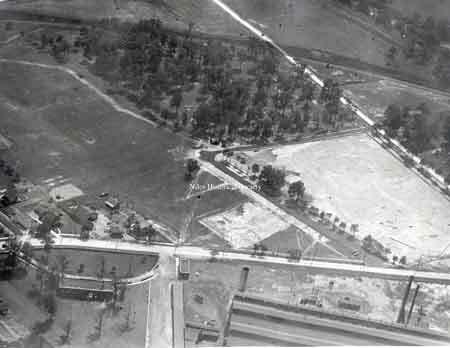 Note the ice skating rink on what is now 5 ballfields. RMI is the industrial complex in the foreground and the Girl Scout office is in the lower right. 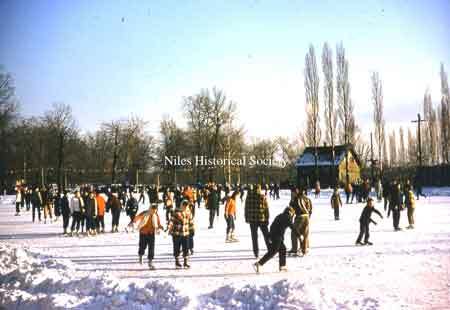 Three activities at Waddell Park: picnicking, baseball, and ice-skating. 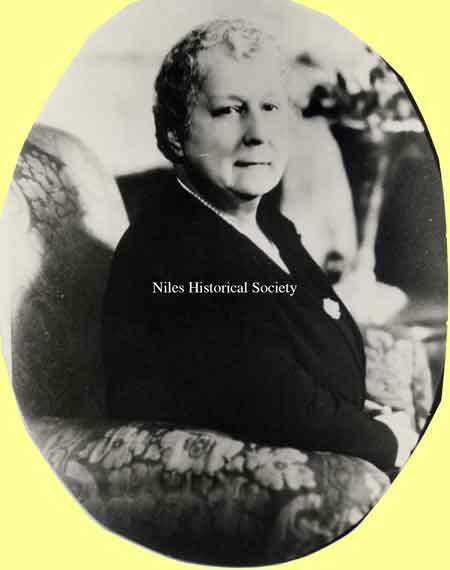 Margaretta Thomas Clingan, daughter of John Thomas, graduated from the Old Central School, led the movement for the construction of McKinley High School (now Edison), in the establishment of Central Park, and other civic projects too numerous to mention.